Late spring is the perfect time to prepare your lawn for insect control. Here in the midwest, we get hit hard with grubs, fleas, ticks and spiders. None of which I want entering my home through one of our dogs or children. This year, we have four new puppies, and the kiddos love to play outside with them, we have to make sure that we not only treat our lawn, but we treat it with something safe for all of our fur babies and kiddos. Every year my husband and I begin our spring lawn care ritual the same way. 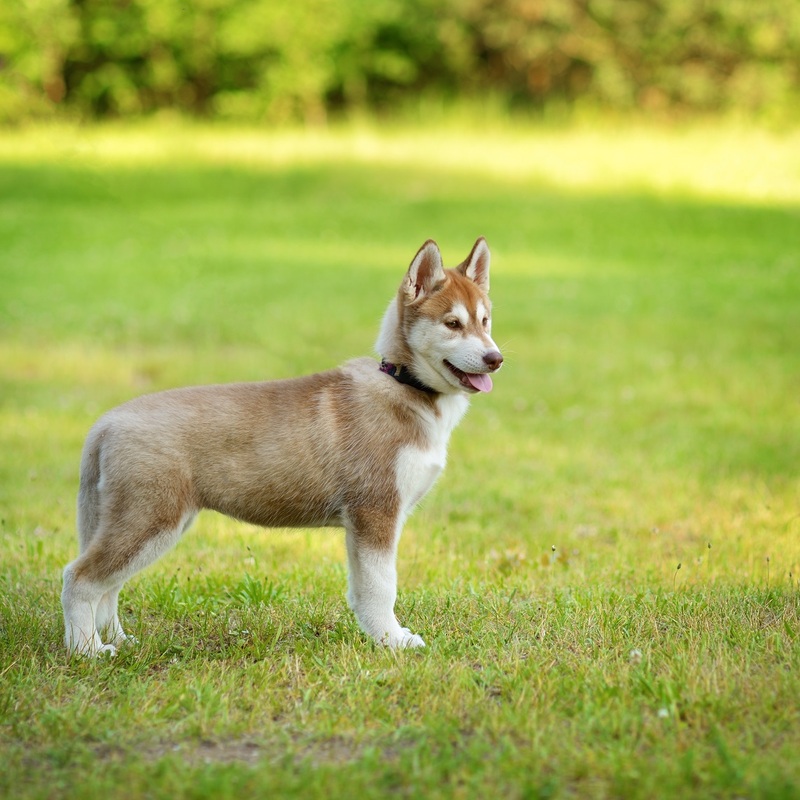 It keeps our lawn looking fabulous and keeps our dogs healthier, and our kids free of bug bites and all that can go along with a simple insect bite. Including Lyme disease, tick-borne disease and thousands of more commonly know disease brought on by a simple insect bite. Step one: Mow your lawn. Mowing in the spring can help strengthen the roots. Be sure to raise the blades on the mower so that you do not cut more than 1/3 of the height off the grass. You can increase the blade in the summer as grass tends to grow faster. 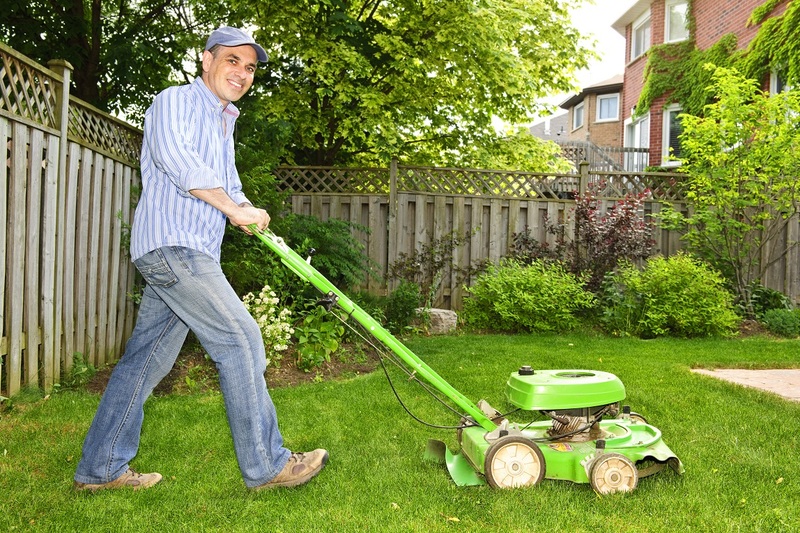 Make sure you mow the lawn systematically as it’s better for the overall health of your lawn. By the way, you can find this fantastic Craftsman lawn mower on sale during the #SpringItOn Member Private Night Black Friday sale @Sears Online 4/17 5 pm – 4/18 11:59 pm CST | In-store 4/17 6-9 pm local time. Step two: You’ll probably notice bare patches in your lawn every year, and if your dogs are like mine, you’ll find a ton of them. My dogs dig all year long at places in the yard. I think they are trying to dig holes to a secret underground doggie world. Regardless of how those bare patches got there, it’s a quick fix. Simply till the bare areas and reseed. If you have pets, keep them away from the area by fencing or roping off the areas until new sod has developed. Otherwise, your fur baby may think it’s the perfect place to dig a new hole. Step three: Once you’ve prepared your lawn for the upcoming season, it’s time to do some damage control before it gets started. 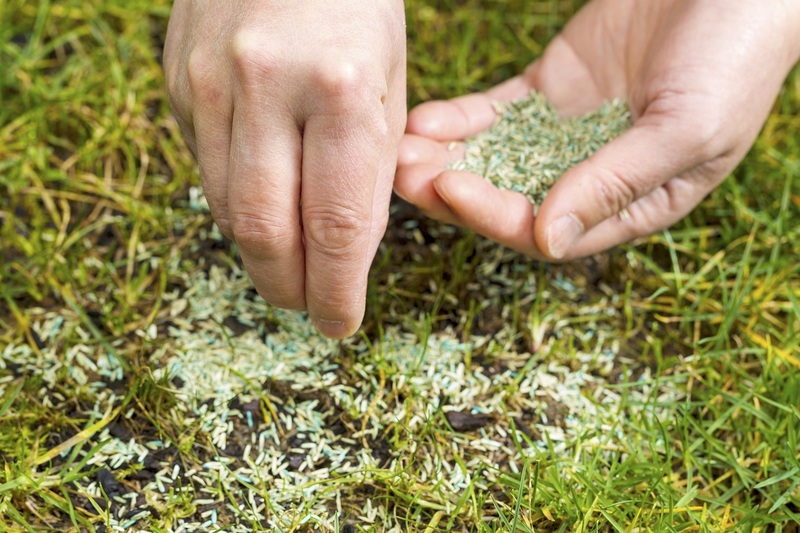 Bugs can ruin your yard and leave you with a nasty mess that can last for years to come. A simple insect control treatment every three months can help you avoid additional lawn issues. 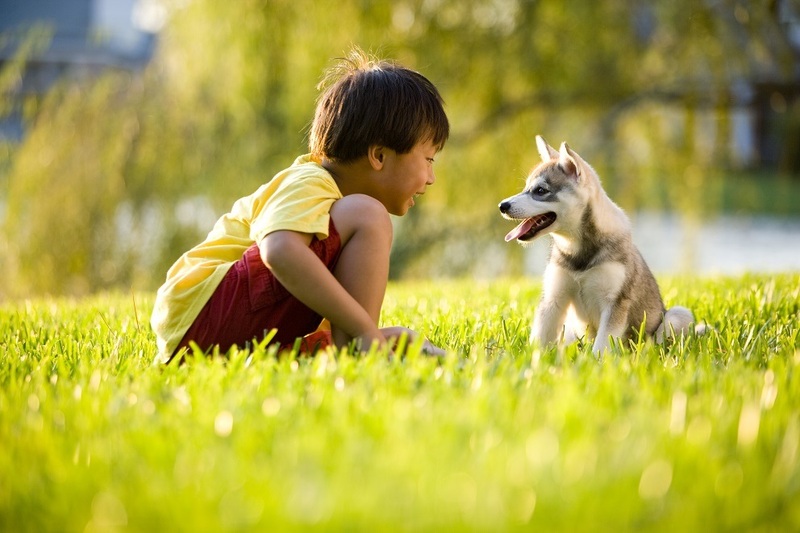 Insect control treatment helps keep your pets and kids free of disease from infected insects. My husband and I use Bug B Gone, but there are a lot of other brands out that that work just as well. However, Bug B Gone is safe for kids and pets. Sears can help you with your lawn care needs that in order to keep your pets and children safe. Taking care of your lawn is much easier than you realize. A few simple steps go a long way. You can meet with an expert anytime to get answers to all your needs. Here’s Step-by-step instructions on how to set up your appointment with sears.com/expert-advice. By scheduling an appointment, your Sears expert will know the lawn and garden product you are interested in. They will help you compare the different options, and offer advice specific to your needs. Members can shop whenever and wherever they need using Sears’ “other” free shopping services like Buy Online, Pickup In-store; In-Vehicle Pickup; Anyone, Anywhere Pickup and Ship-to-Home. @Sears is also giving away a $50 Sears gift card to help you get a head start on your lawn care. It’s easy to enter. Simply sign up for your chance to win! Come back here and see how our appointment went with our Sears lawn and garden expert on April 18th. We will update you on some of the items we purchased through Sears for our particular lawn needs. Plus, we’ll be giving away a second $50 Sears Gift Card! So that’s two chances to win! Start your spring off right with the help of @Sears Lawn and Garden experts. They are there to help you. If you’re not a Private Member yet, it’s easy to sign up. Don’t miss out on the fantastic deals and services that you can only get by being a Private Member! As you most of you already know, last night we met with a lawn and garden expert at the Sears Members Private Night Black Friday sale. Not only did they verify our pest control needs by giving us more updated information on insect control, but they helped us select a kennel as well! If you follow us on social media, then you probably already know we have four puppies. While we’d love for them to be able to stay outside longer than we might want to stay out and watch them, we were not sure what the best way was to go about this. 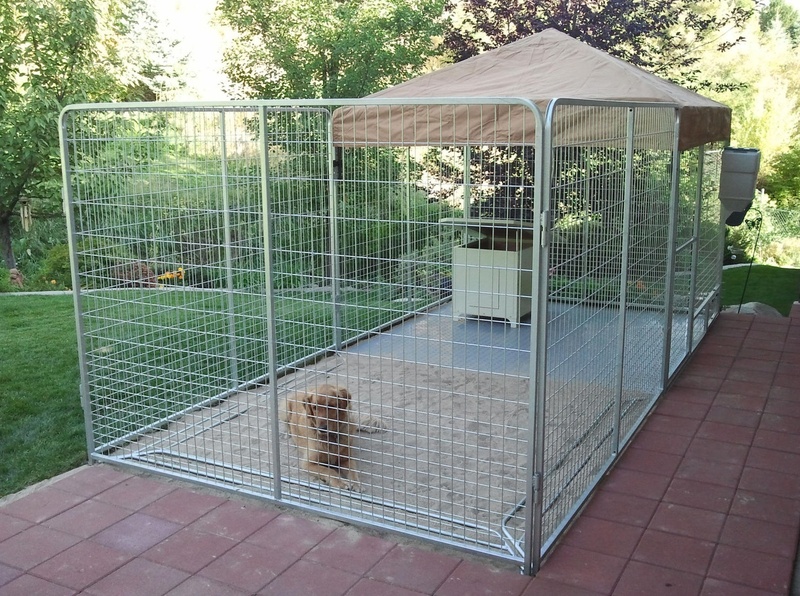 One of the team experts at Sears recommended the Kennel Pro Ultimate Galvanized Steel Yard Kennel. It’s more than big enough for the puppies to enjoy time outside. Plus it has a cover to keep them out of the sun. It’s also very easy to put together. Yup, we brought it home for our fur babies! Selected Best have a good guide if you’re looking for a dog crate for your lawn also. The Sears’ main “Spring It On Black Friday” spring sale will take place April 22-23 in-stores and online. Make sure you check it out and get all your lawn and garden supplies while they are on sale! Disclosure: I’m a member of the Sears Squad. While Sears may send me products to try or compensate in in additional ways for my opinion on their brand all opinions are my own. Does your dog do crazy things and you have no clue why? We have someone that does our lawn, but we are always concerned about the products being used. Thanks for the great post, and information. We just spent al last weekend preparing our lawn for spring and summer. We had the worst moss problems in out lawn over the winter! We live in Ohio and are preparing to start our spring yard duties. With a little one that is constantly on the go and loves to play outside and two pups, we have been doing as much research as possible to make sure we use products that are safe for the entire family. Thank your this post, it is always great to find products and companies that are working to keep our family safe while making our yard look the best that it can! Thanks for the informative post. I appreciate the information. I bookmarked your post. I live in Pennsylvania, so this will help me. Thanks for posting this! It’s so nice to have one checklist in front of me. I had no idea that there was a Bug B Gone product. That would so help us when dealing with the influx of insects as soon as the weather gets warmer. Heather, be sure to make an appointment during the Member Private Night Event. Here’s Step-by-step instructions on how to set up your appointment with sears.com/expert-advice. Please make sure your preferred appointment time is during the 4/17 Member Private Night. They can assist you and make sure you get something that is safe for your daughter and puppies! Great tips on preparing your lawn. I can’t wait to use some of these products on my lawn just as soon as the weather gets warmer. Sears has always been my go to store when preparing my lawn and home, they have such an array of products and plants we use every year. Love the lawn mower! Lots of great information here. I think it is great that you can make an appointment and have an expert guide you through the process on what products are best for your lawn. I never knew Sears did that. I have definitely got to find some of that bug be gone. I have three children and a dog who like to play in the grass during the spring and summer but they end up getting bit up by bugs! These are great tips. I never knewyou even had to protect your lawn from insects. My husband an I only got a home with a garden last November and we hasn’t grown a proper lawn yet – there was pavement all over the garden when we got in. My stepdad would love this! Thank you! Oh man, my lawn is a MESS. We were traveling a lot of last summer, so we didn’t take good care of it then & we have a lot of making up to do for that this year. I am so ready for spring!! We need to start treating our yard to get it ready for summer time parties, I had no idea that series had these events. Down here in the deep south, the bugs are already out. We have already started the yard work too, mowing and raking and the bug battle process. I hope you don’t have as many bugs as we do! Our new bag of grass seed has been purchased and is only waiting on us to prepare those bald patches in the lawn for seeding! Such timely info. This looks great! We are working on buying a home now, so all this is very helpful information – thanks! There are few things that can ruin outdoor time for me like MOSQUITOES! Yuck. Thank you for all these great tips! Reminds me that there’s a few things I need to purchase to prepare for the warm weather period ahead. No lawn to mow or take care of here. My client who has a beautifully landscaped garden and grassy areas has someone come in quite often to take care of it. Of course it would be nicer if you could fo it by yourself–and it seems you can! I’m always afraid to do this myself. You see all the lawns ruined by a DIY. How do you know if you’re using too much or too little? Thanks for sharing all of those tips! We have some empty patches of ground that we really need to re-seed this year and ticks are a big concern where I live too. I will look for the Bug Be Gone product. I think we need some of that. I am in Canada so Sears is harder to find up here now because they closed several of them. I really was disappointed when they did that because I loved Sears and have shopped there forever!!! These are great tips and I need to do some of this NOW. We have that same list in the spring other than our lawn mower blew up the first cut this year! Looks like we are making a trip to Sears right a way! I love that I can get everything I need in one place from a brand I trust! I am going to have to check out sears with all these deals i will save. I love saving money. We are redoing our whole backyard. Needs to be updated. Thanks for sharing all this info. I have a lot of bare spots, from my dogs. I treat our yard every year so we don’t have insects. Thanks for all of the great tips. We still have a while to go before the snow melts! I have no idea what the yard will look like afterwards this is the first year we have been here. I love Sears. These are some really great tips you have here. I need to take care of my lawn as soon as I can. Thanks for the great info. We live in the country and have a rather large yard. We like products that are safe for our grand kids and our pets. I’ll be looking into the Bug Be Gone this week. It’s not something we do but really should. I am hoping to be able to start working on our lawn this weekend. My husband has a couple extra days he took off so it would be a good time. It needs lots of work. I think it’s important for anyone regardless of age to have safe products. I will have to check out the bug be gone, that would be helpful. I hate doing the yard work, but if I don’t do it, it won’t get done. I wish I had money to pay someone to do it. I had a few kids come by 3 years ago, and they said they would do the yard for $20. Thinking this was a great deal and appreciative of the neighborhood kids, I said yes. When they were done, they charged me 20 each! There was 4 kids! I WON’T DO THAT AGAIN! Me and hubby are looking into a new lawn mower and possibly changing the grass, We have the grass that turns brown in the winter and green in summer but I would love something nice year round! Thanks for the review! I knew that mowing the lawn made it look better, but I didn’t know that it strenghtened the roots! We’re stuck on step one until we figure out why the lawnmower isn’t firing up this spring. We just started having our lawn fertilization done by a national company. I’m always concerned about the products used but was assured it’s safe. My husband does everything else; moving, grass seed, etc. So information provided is great to know. I can’t wait to tackle our lawn. We literally have a couple sink holes from the winter…ugh. Just got the lawn mowed but our dogs sure did a number on it over the Winter months. Lots of re-seeding going to happen soon! Ortho Bug B Gone is my must every year and I do their spray too; I create a perimeter around my house every three months. Southern California is a giant ant hill.